One of the most under used features is the Windows Searching feature. So many people don’t even realize it’s there, which is surprising since it’s been there since Windows Vista! This great unknown tool really makes it easy to find files in your system. The search feature in windows is fast and powerful! Not only will it search for names of documents and items you have in your computer, but it can also search for text inside of your documents. For example let’s say you wrote a paper last month, but you don’t remember the name of the document. In that document, you remember some unique text, such as “Computer Guy”. Well, search for that and Windows will find the document that contains that text. 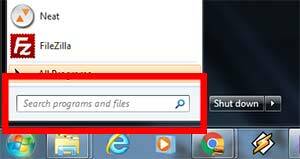 You can use the search to find programs in your computer. So instead of going to all programs and looking for it, just search for it! Is there a setting you want to find and change in your computer but don’t know where to find it? The search can help with that as well. For example, many people don’t know where to find the setting to change your desktop background. Instead of poking around, use the search and type “background” or “change background”, and odds are high you’ll find what you are looking for. If you don’t, try other words that might fit the bill. If you are in Windows 8 and you get the full screen start menu, you’ll notice there is no search box. The feature still works! Just start typing and it will pop into a search box. In fact in all versions of windows after XP, all you do is click start and then start typing. You don’t even need to put the curser in any box. We use this feature all day and find it one of the most useful features of windows.